The nominations for the 31st Annual Hong Kong Film Awards were formally announced the day before. 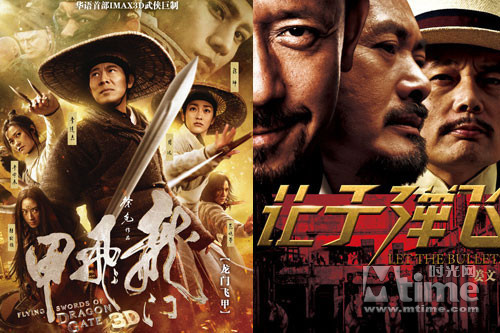 Tsui Hark’s <徐克 > Flying Swords of Dragon Gate <龙门飞甲> and Jiang Wen’s (姜文) Let the Bullets Fly <让子弹飞> were nominated in 13 awards categories. Peter Chan’s (陈可辛) Wu Xia <武侠> picked up 12 nominations, Felix Chong (庄文强) and Alan Mak’s (麦兆辉) Overheard 2 <窃听风云2> received 9 nominations, and Ann Hui’s (许鞍华 ) A Simple Life <桃姐> and Johnnie To’s (杜琪峰) Life Without Principle <夺命金> had 8 nominations. In the Best Actor category, Jiang Wen (姜文 ) and Ge You (葛优 ) were both nominated in the Best Actor category for their performances in Let the Bullets Fly. Interestingly, Chow Yun Fat (周润发) was omitted from the nomination list despite receiving lead billing in Let the Bullets Fly. Sean Lau (刘青云) was nominated twice in the Best Actor category, for Overheard 2 and Life Without Principle. Andy Lau 刘德华 (who received the Golden Horse Best Actor Award for his performance in A Simple Life) was also nominated in the Best Actor category. Receiving critical acclaim for her performance in A Simple Life, Deanie Ip (叶德娴 ) won the Best Actress Award at the 68th Annual Venice Film Festival and also the 48th Annual Golden Horse Awards earlier. Deanie Ip was a hot favorite to win the Best Actress Award at the 31st Annual Hong Kong Film Awards as well. Other actresses nominated in the Best Actress category include Gao Yuanyuan (高圆圆) for Don’t Go Breaking My Heart <单身男女>, Shu Qi (舒淇) for A Beautiful Life <不再让你孤单>, Tang Wei (汤唯 ) for Wu Xia <武侠>, and Zhou Xun (周迅) for Flying Swords of Dragon Gate <龙门飞甲>. Former HKFA Best Actress winners, Carina Lau (刘嘉玲 ), was nominated for her performance in Let the Bullets Fly, while Kara Hui (惠英红 ) was nominated for Wu Xia in the Best Supporting Actress categories. Last year’s HKFA Best Actor recipient, Nicholas Tse (谢霆锋) was nominated in the Best Supporting Actor category for Shaolin <新少林寺>. Carina Lau was very happy for her nomination, expressing her gratitude towards Director, Jiang Wen, and Ge You. Donnie Yen (甄子丹 )was nominated for the Best Action Choreography Award for Wu Xia, competing with notable action choreographers such as Ching Siu Tong (程小东) for The Sorcerer and the White Snake <白蛇传说> and Yuen Kwai (元奎) for Shaolin <新少林寺>. The 31st Annual Hong Kong Film Awards will be held on Sunday, April 15, 2012 at the Hong Kong Cultural Centre. Local stations, TVB, nowTV, RTHK Radio 2, and Mainland’s CCTV6, will be broadcasting the awards ceremony live. Watch Trailers of the 5 Films Nominated for Best Picture! Jayne: Wow, a very exciting nominations list for the 31st Annual Hong Kong Film Awards. A lot of big stars on the list, expect to see a star-studded red carpet on April 15th. I was quite excited when I saw the trailer for Let the Bullets Fly last year, but never got a chance to see the film. I suspect it will have a good chance in getting the Best Picture Award, with A Simple Life as its biggest competitor. while Deanie Ip will win Best Actress, and Andy Lau may be a strong contender too. In the Best Supporting Actor category, I root for Kenneth Tsang Kong, an amazing veteran actor. Has he won any HKFA awards in the past? SURPRINGLY, Chen Kun did not get nominated for his role in Flying Sword. He was the most outstanding actor in that film. Agree. His chac is a lot better than Jet Li. Deanie Ip will win because she won the major western awards so if she doesn’t win for this much lower standard of grading award, I wonder who should then? I watched Overheard 2 the other night and yes Kenneth Tsang is just great! Btw you can watch him in one of the episodes in ICAC 2011 RTHK. Yes, Overheard 2 is very good by my standard. Hope they win. But ‘Let the bullets fly’ is very average. wasted my 2 hrs. Kenneth Tsang is my favorite veteran male actor, closely followed by Paul Chun. Kenneth appeared in a few Hollywood movies, such as “Anna and the King” and “James Bond Die Another Day.” He speaks very good English and has such screen presence. This year’s HKFA nomination list looks quite exciting. The actor I want the most to win a HKFA award this year is Kenneth Tsang. I don’t think he has won this award in the past. I got this information from wikipedia. Kenneth Tsang graduated from UC Berkeley with an architecture degree. No wonder his english is so good. He’s my favorite veteran male actor too! Go Kenneth! Yea, Kenneth used to go to school in the US before. I heard that he did not like his job as an architect so he entered the acting field… Glad that he did since he is a great actor. Kenneth was an engineer not architect. Oops. Sorry, wrong info. I thought you were talking about Kenneth Ma. hah architecture degree… reminds me of my unemployment disposition in this down economy. I used to see him in a lot of TVB series and loved his acting. I really miss seeing him in series but of course now that he has entered a different realm in his acting, I will not be seeing him series anymore. The last series that I ever saw him in was Liu Xing Hua Yuan(Meteor Garden)2. His role was not that big but he did a great job as always. Why is Louis Koo not nominated? He is the best talent in Hong Kong or even internationally. Many of the past acting awards winners in both Hong Kong and Taiwan I feel are no match for him. Louis Koo is popular and box office draw but indeed I rarely heard of critics applauding him for ‘acting’ awards.